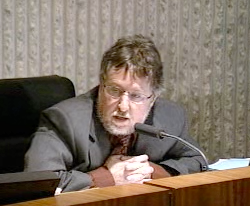 As I reported previously, on Tuesday Costa Mesa Budget and Research Officer Bobby Young and City Manager Allan Roeder briefed the City Council on the current financial condition of the city. The news is bleak. On the positive side, the news is less bleak than it might have been had the city not taken measures prescribed in Roeder's 10-point plan last year. Regardless, the news is so dire that even more extreme measures were presented to the council for their consideration as possible ways to avoid scraping the bottom of the Fund Balance barrel to meet our financial obligations in the fiscal year that ends June 30, 2010. 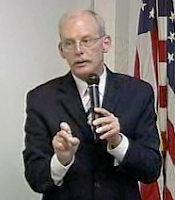 Young told the council and assembled staff that all major revenue sources - Sales Tax, Property Tax and Transient Occupancy Tax - are down and, in the case of the Sales Tax and TOT, down significantly. Property Tax showed a slight dip, but is expected to drop like a rock in the next fiscal year. 2 - Freeze all Capital Outlay Purchases and Capital Improvement Projects using General Fund Revenues. No, that doesn't mean street projects will stop - most of those are performed through the use of grant funds. 3 - Place a moratorium on new programs and services, expansion of existing programs and services and new projects requiring General Fund support. 4 - Review use of Equipment Replacement fund reserves. 5 - Initiate discussions with Employee Associations regarding wages and benefits. Once again, this is where the money is and there is no reason to expect that additional concessions will not be necessary to balance this year's budget and next year's, as well. 6 - Prepare tax schedules with alternatives and supporting resolutions for Transient Occupancy Tax (TOT) and Business License Tax for the November 2010 ballot. Yep, they are back! Once again the council will be asked to consider placing before the voters an increase in our TOT - and maybe the Business License tax, too. Both are cellar-dwellers when compared to other Orange County cities. In fact, our TOT, at 6%, is near the bottom state-wide. Even a 2% increase will place us below the minimum for the county. 7 - Submit all City Programs and services to City Council for budget prioritization. This is a biggie! This kind of exercise has not been done for nearly a decade. It's going to force the council to make tough decisions about how this city spends it's diminishing dollars. More than a year ago Roeder cautioned the council about the precarious condition of our city's finances. He and the staff created a plan that, making some assumptions about issues that were unpredictable, might get us through this year. Sadly, the economy kicked us in the teeth with more ferocity than anticipated. As a result, unless some of the items above are implemented immediately, it will be necessary for the city to dip even more deeply into the Fund Balance account - $9.3 million as opposed to the projected $4.6 - to balance the 2009/2010 budget. And, even more disconcerting, there will be insufficient funds remaining in the account to help with the 2010/2011 budget next summer. If we end up using that $9.3 million this year, the city will have used more than $30 million in Fund Balance to balance our budget in the past two years! Roeder and staff hopes to have information available to the council at their meeting on the 16th to be able to make informed decisions on some or all of the proposals above. As expected, "the usual suspects" stood before the council to rant about the budget. Judi and Mike Berry - Perky and Dumbo - attempted to influence council decisions by presenting made-up numbers. Their predictable puppet show is getting very old. They imagine themselves financial experts, yet Perky couldn't get her numbers right and Dumbo was, well, himself - confused and confident. 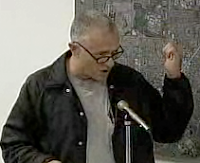 And, our municipal racist laureate, The Mouth From Mesa North (an aging, frustrated, mediocre actor who throws himself before any camera available), presented his blustering self to the council and told them flat out that he could cut 20% from the budget and not cut a single person. 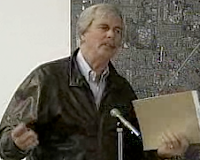 His two-minute tirade - it seemed much longer - was the same old stuff about buying and demolishing what he considers slum buildings in the city and complaining about the cost of the city helicopter. Later councilwoman Katrina Foley and City Attorney Kim Barlow set the record straight on his complaints. Much of what he wants to do is illegal - never a worry for him, the alleged lawyer. Police Chief Christopher Shawkey explained why we use the current style of helicopter instead of the Tinkertoy machine The Mouth prefers. The city is in deep guano and things are only going to get worse. Forty of the 54 people who opted for the retirement incentive will not be replaced. In addition, if the hiring freeze proposed above is implemented it will begin to affect service levels almost immediately. Things like streets being swept less frequently, delays at the Planning counter and slower responses to every kind of inquiry or call for service - except public safety calls - can be expected. Roeder will attempt to quantify those impacts for the council at their next meeting. It's important for the residents of this city to communicate with our elected leaders to let them know what OUR priorities are in these difficult financial times. Some tough choices will be made in the next few months, so now is the time to let the City Council know how you feel. Call them at 714-754-5285 or send them your opinion via email at op2council@ci.costa-mesa.ca.us. 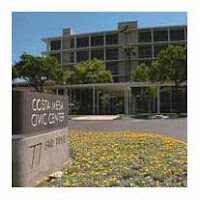 At it's meeting tonight the Costa Mesa Planning Commission gave cursory review of the General Plan and approved the latest step in the development of an assisted living facility on the Westside. They also batted around plans for fencing at Cal Trans entry ways into the city, batting around Cal Trans in the process. FAIR BOARD PUNTS - AGAIN! The Fair Board pushed it's meeting scheduled for Tuesday, February 9th off to February 25th. Once again, this is apparently due to it's inability to establish a quorum. This is second time this has happened in a week and makes one curious about just what's going on with the Fair Board. Did some of them not make it back from their junket to the Barrett-Jackson Auction in Arizona? Where the heck are they? The Register's Orange Punch blog speculated that the meeting, which they referred to as an "emergency meeting" was being called to vote on a proposal to oppose the sale of the Fairgrounds. If so, that would be quite a reversal from their original position in which they urged the State to sell the Fairgrounds - to them! At it's Study Session tomorrow the City Council will hear Budget and Research Officer Bobby Young tell them that, despite some very significant savings in areas of the 10-point plan approved last year, the city still is in deep guano from a budget standpoint. Among the numbers he will lay on them is the fact that we will be using double the amount of Fund Balance dollars to balance the remainder of this year's budget than was anticipated - $9.3 million vs. $4.6 million. On the positive side, the attrition savings from the implementation of the enhanced retirement program resulted in an anticipated $3.6 million this fiscal year instead of the planned $3.5 million for the next calendar year. According to the staff report, as of the closure of the window of opportunity for this plan, 12/31/09, 54 employees took advantage of the incentive and the management staff has determined that 40 positions can remain vacant. Originally, it was estimated that 50 people might retire under this program and that 25 positions might remain unfilled. This difference basically doubles the savings. What it does to service levels remains to be seen. Based on the fact that all revenue sources are in decline, the staff is recommending reducing projected estimates for all revenue sources by $7.1 million. Sales Tax revenue decreased by 7.1% and the Transient Occupancy Tax dropped by 15.9%, for example. It will be interesting to see just what the council has in the way of direction for staff when this issue is formally presented to them at a scheduled meeting in the near future. CLOSED SESSION - LEASE/PURCHASE PLAN? In an unusual bit of scheduling, next week both the Planning Commission and the City Council will meet. The Planning Commission, under the guidance of Chairman Jim Righeimer, will review the city's general plan and discuss a development on the Westside in which senior housing is being proposed. The City Council will hold a Study Session on Tuesday and will devote the entire time to a discussion of the Mid-year Budget review. This should be very interesting because we should have a pretty good idea of how the city is doing in the revenue department - both sales and property tax numbers should be available - and also should have a much clearer idea of the impact of the enhanced retirement package that was offered to nearly 150 employees. A special City Council meeting will immediately follow the Study Session, but it will be a closed session at which the sale of the Fairgrounds will be discussed. When I saw that item I wondered just what there is to discuss right now, since the State has not indicated whether they will accept or reject any or all bids in the recent auction. 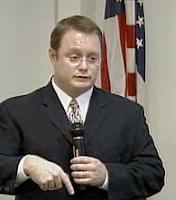 Then, tonight I discovered the YouTube video of Councilman Gary Monahan's visit to radio station KOCI 101.5 FM last weekend. This nearly 10 minute snippet of his time on the air was illuminating because he told the radio audience that the city is currently pursuing a Lease/Purchase option with the State for the Fairground property that might turn out to be more profitable to the State in the long run. That was the first I'd heard of that plan. It's interesting that no member of the real media has reported that fact yet. You can watch the clip and learn more for yourselves. Remember, this is radio and the video is very poor.